With Asciidoctor markup we can position images in our document. 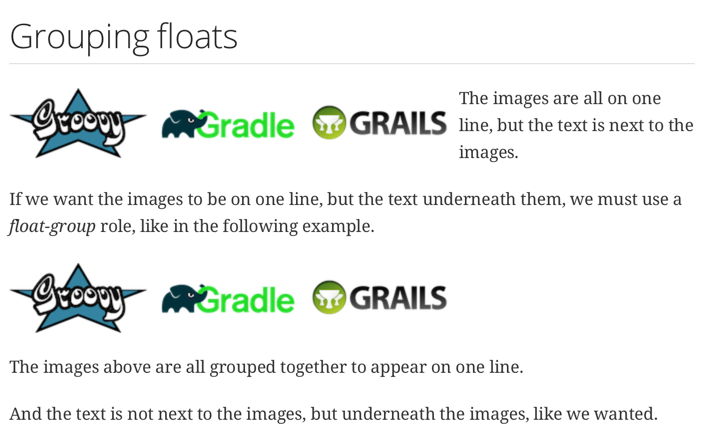 We can even float images, so text can next to an image, inside only below or about the image. We can also define multiple images to float, so the images are displayed on the same line next to each other. Any text that follows these images is also displayed next to the images. If we want only to have floating images, but the text starting under the images we can place the images inside an open block and assign the block the role float-group. // Define float role, instead of attribute. but the text is next to the images. to appear on one line. underneath the images, like we wanted.